I apologize for being away for a few days, but I have been very busy working on some BIG projects. Pictures and stories to come this week (YIKES!). Is it bad that Home Depot knows me by name now? Oh well; I can not wait to show you behind the scenes at the Schoenle Workshop! Anyways, it's Tuesday and that can only mean one thing... TIPS and TRICKS! My tip of the day is about storage. You can never have enough storage, especially with children in the house. Who am I kidding, though, I have more junk than the kids do. Weather it's you or the little rascals, we all need a place to put our crappola. Vintage suitcases stacked in a corner, next to a fireplace, or even on a dresser are perfect for storage. They are sturdy, have pockets, and are all so unique. I found an old tool box that has a beautiful turquoise color on it. I love the wear and tear that it shows. I used to keep it next to my couch with blankets inside, but it will be leaving me this week and heading to a new home. Old hat boxes are perfect, too! They are great for seasonal items like bathing suits or scarves. My mom found these for me. One was even my Grandma's. Welp, there is my tip of the day. Plastic storage bins are great, but they aren't the prettiest. I challenge you to find something unique and vintage to store your crappola. 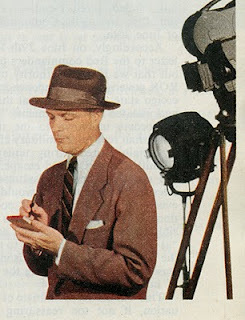 Just like the Mallory Hat's Slogan used to say... "Make like a reporter and get one!" No work today!! C and I went to hear Swoop read books at UrbanSwirl!! We ate ice cream for breakfast. At least I made him eat a banana first. Hahah! He told me, "Mom, you're the best!" I did have some inspiration, though... my hint is green! Welcome to "Tipsy Tuesday!" No, I'm not over here gettin' my drink on... I'm here to give you my tips of the day. I hope you find them very useful. 1. ALWAYS ALWAYS check your spray paint before you leave the store. I can not tell you how many times I have come home, prepped my area, positioned my piece just perfectly, opened the can of spray paint and the teeny tiny piece on the nozzle was missing!! 2. Be sure to wear gloves when spraying or it will definitely ruin that freshly done manicure of yours. 3. Either place your piece on the grass, on a drop cloth, and/or large piece of cardboard. That spray paint can go up to ten feet. Make sure nothing else is around you. You never know where else it is going. 4. A mask is always nice to have even if you are spraying in a well ventilated area. Those fumes can cause headaches in minutes. 5. Shaking your spray for about 7-10 minutes will help to reduce the grittiness of the paint on your piece. 6. Spray primer is always a good thing to prep with. I usually rough up my piece, prime, and then spray. 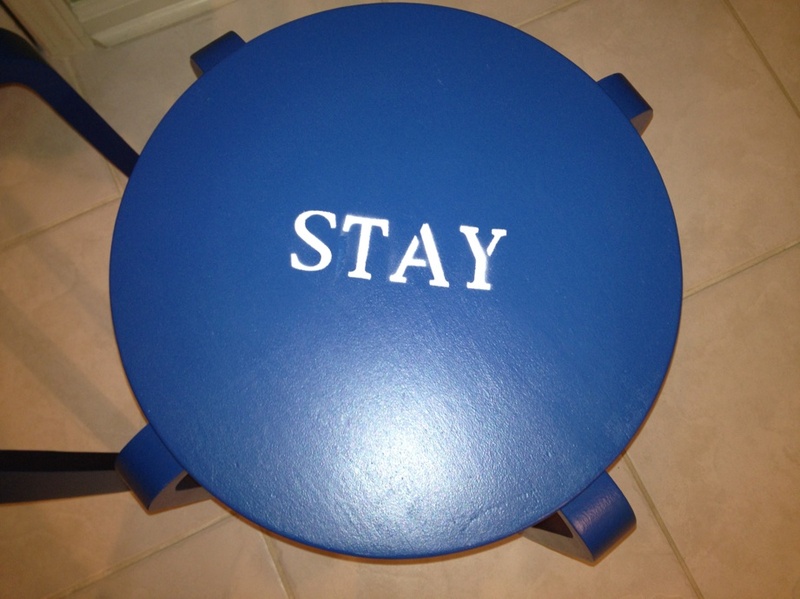 Polyurethane spray to seal your final product is the best, also! 7. Last, but not least... spray paint is relatively inexpensive, but Hobby Lobby and Michaels always have 40% coupons that can be used on paint. I usually go to WalMart, though. The paint there is priced well, they have lots of great colors, and when your nozzle is broken or missing a piece and you are determined to finish your project before you go to bed... WalMart is always open! Old Chair with Hobby Lobby pillow to make it POP! Lady Bugs on the back for a sweet surprise! Some of you may have heard about this new paint by Annie Sloan. It is a chalk paint; and it is amazing! 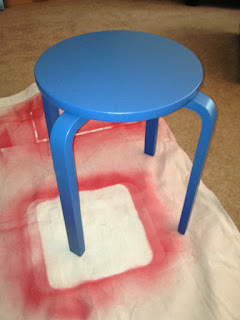 You can literally paint anything without priming or sanding. There is no prep whatsoever. However, the price of this paint is quite pricey and it only comes in a handful of colors. Well, guess what? I have found a solution to having everything you want: cheap, lots of color choices, and still no prep work. My neighbor told me about this chalk powder she found on Etsy. It's called Webster's Chalk Paint. It is unbelievable. For 14 dollars and a couple bucks for shipping you get a bag of chalk powder that you can add to any color paint you want! You simply add 2 TB of powder, 1 TB of water, and a cup of latex paint. It lasts forever and you can get about 6 cups of paint out of the whole bag. Here's the topper... you can either add it to paint you already have and/or you can go to Home Depot and get one of those Behr Sampler paints for $3.00 and turn it into chalk paint. I'm telling you it's the talk of the neighborhood. All I did was clean up the table, mix my paint, and painted two coats. I did use a wax to seal it (which you can also get from Webster's) and then distressed it a bit. It was so easy and dried in no time at all. Remember the table I rescued from the side of the road? 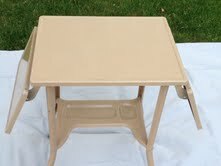 It was chalk paint with dark wax, too! This stuff is amazing. It cuts your work in half! Not to mention the seller is so helpful and has a site full of inspiration. Here's the link... check it out yourself! Nothing beats a morning with my Mom and treasure hunting. I did pretty well considering Garage Sale season is coming to an end. I don't know what I am going to do with myself when fall gets here. Saturday mornings, loud music, and my McDonald's chocolate chip frappe is what keeps me sane. I get this high to be the first one at a garage sale, to find that "special" treasure, and to fill the back end of my car. Being a stay-at-a-home mom now is a blessing, but I need my ME time, too. Anyway, here's a pic of my filled garage. Poor Andrew does not even have a place to park. Maybe come winter I'll have cleaned things out... haha!! Ok, here is where I need your help. See that cool chair? 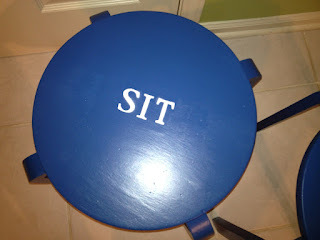 I LOVE the blue seat cushion so I am not doing anything with that, but do you think I should keep it the natural bamboo color or paint it a stark white or something to make the blue pop? I need suggestions! Oh and by the way, that magazine rack will be a whole separate blog. Wait until I introduce you to this new paint I found! Happy weekend to you all and Happy Anniversary to the hubs and me! 5 years and going strong :) Toodles! Some of you may call me a thief after this post. I'll apologize now but I HAD to have this table. I passed this house while driving to my parents one day that had a couch and three end tables in the yard. I kept looking for a FOR SALE sign, but nothing... I told myself, "If the stuff is still out there on my way home it's my sign to stop." Well, lucky for me the stuff was still there. I was very hesitant because the house was pretty much a dump. I stopped, looked for another sign, knocked on the door, even knocked on the neighbors' door-NO ONE to be found. I swear this one table was calling my name. The detail in it was just gorgeous! So I rescued him or stole him, however you want to put it. I can not begin to tell you how bad this table was. I don't even have a picture of the before because it was so gross. I tried to be a CSI and figure out what the heck was on it, in it, and under it- NASTY!! Don't worry Doc McSchoenle gave him an hour long bath. It used to be a dark wood with a fake leather piece on the top. I went with an off white color to bring out the detail. Say it like the aliens from Toy Story, "Ooooohhhhh aaaahhhh." I know...gorgeous, right? I could not be happier with the results! I distressed it just a little, but the dark wax really made the details POP! I think he is just perfect and I'm sure if he could talk he would say he was rescued rather than stolen!! Who doesn't love red and who doesn't love FREE??? I was driving through the neighborhood one day and found this vintage typewriter table on the side of the road. The sign on it read, "FREE FREE FREE!" I said, "YES YES YES!!" It was an ugly blah color so I knew it needed a statement color to bring it back to life. I sprayed it with a lipstick red color. I did not sand or anything. It was in perfect condition so I did not bother. It took me about two cans to complete the project. I still thought it needed a little jewelry so I found a basket for a buck at Goodwill, sprayed that a teal color I already had and it fit like a glove in the bottom of the stand. Isn't she purrrty? She could be used as a beverage cart or even a side table? The sides of the cart fold down and it's even on rollers! All she needs is a home now. I decided to go with a beautiful blue color. 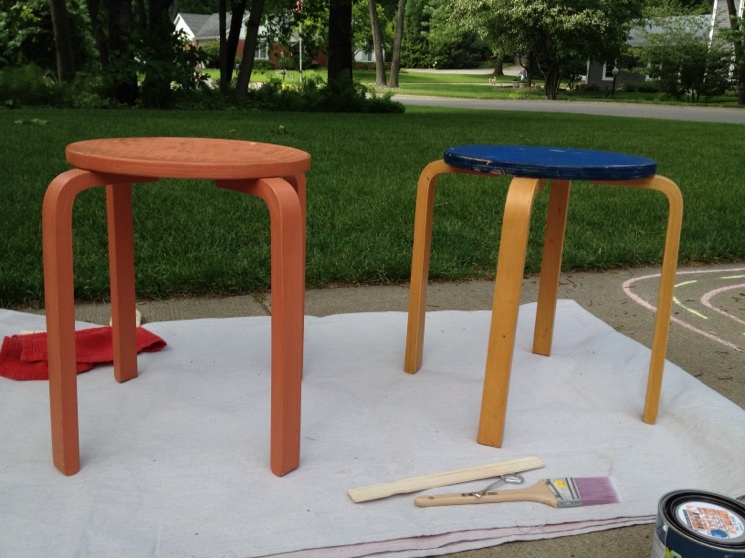 I sanded, primed, and painted two coats. Isn't it a great color?? I went to Michaels and found some cheap letter stencils and got to work. Unfortunately, the ones I bought had about four different letters on each board. 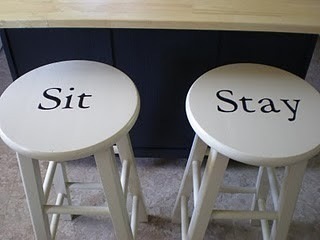 I had to cut each one out, tape them together, and thennnn use a ruler to measure the center of the stools. I was like Magyver trying to simply create, "sit" and "stay." I sprayed them with white spray paint and gave them a coat of poly. What do you think?? 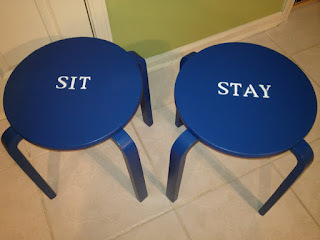 These stools are the perfect size for side tables or could even be hidden under a sofa table to pull out for extra seating. I'm not sure how I feel about stencils, but I love my stools! My first post is a simple and fun project I completed in two days. 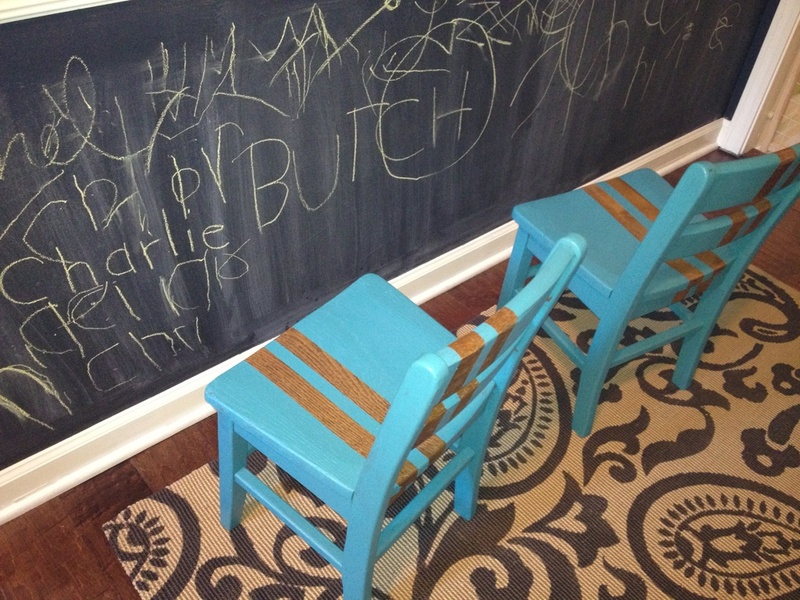 I just recently painted one of my walls with that awesome chalkboard paint and needed some cute chairs for the kiddos to relax on. 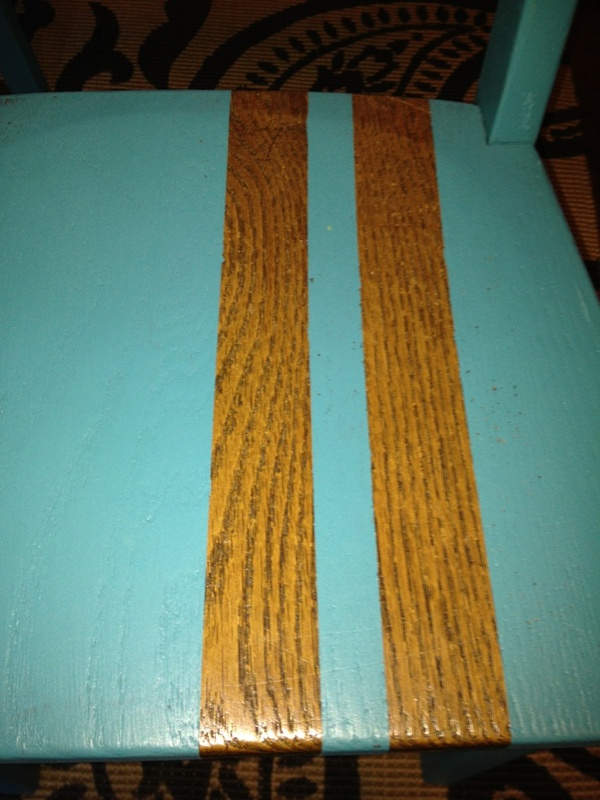 I went shopping in my Grandpa's basement and found two wooden chairs that were perfect. I'm sorry I don't have a before picture, but just close your eyes and picture two small, wooden chairs and that's what they looked like before I got my hands on them. I already had some turquoise paint so I decided to use that rather than buy more. Instead of painting them solid I decided to add a little detail using painter's tape. My favorite is the green Froggy kind. It has yet to fail me. I taped off, painted my first coat, waited 24 hours, painted another coat, waited 24 hours and then took off the tape. This is what I was left with! Isn't it neat with the wood grain showing through?? 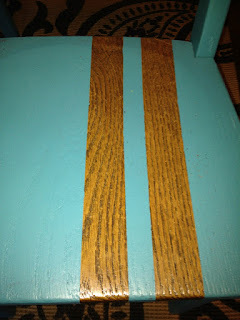 I did spray a coat of polyurethane on them so they would hold up better. That's it... simple and different! Happy thoughts? Hello and thank you for visiting my blog! I can't believe I finally did it. After teaching for 7 years, I have decided to be a full-time mom and a part-time furniture guru. I have my husband to thank for letting me choose this new adventure. I also need to thank Katie Femia for answering my many questions and Joyce Collins for keeping me on my toes and always introducing me to new and awesome ideas! I hope that my blog inspires anyone and everyone that visits. It is such a pet peeve of mine to hear people say that they are not creative. Anyone can be creative! I hope that my posts help give you that crafty itch to try something you've never tried before.